Abstract: A 60-year-old female was treated for depression with the antidepressant paroxetine for 13 years. The patient had experienced clumsiness and mild rigidity in the left hand, and had agraphia and mild subjective memory complaints for 3 years prior to admission in our hospital. She experienced exacerbated depression that included worsened depressive mood, lowered motivation, and suicidal ideation without precipitating stressful life events for 2 years prior to admission, and although she had continued taking the antidepressant, these symptoms were not ameliorated by increasing the dose of paroxetine. Following the development of myoclonus and pain in her left arm, we performed magnetic resonance imaging of her head, that revealed diffuse atrophy and right parietal lobe atrophy. 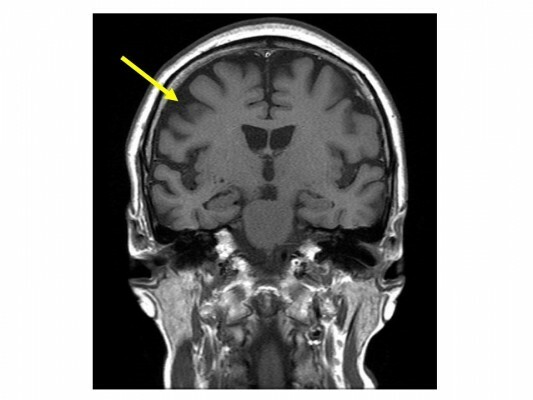 The patient was ultimately diagnosed with corticobasal degeneration (CBD). Her left arm myoclonus and depression improved following levodopa administration. Therefore, we concluded that the recurrent depression may have been induced by CBD.